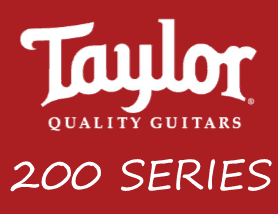 A couple of weeks back I posted an overview of Taylor’s 100 series. 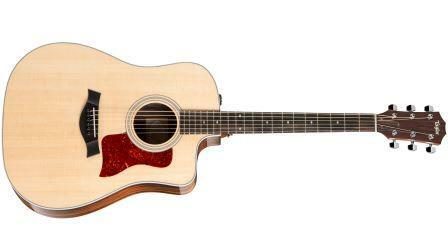 So I thought I’d do a follow up that post by looking at the Tayor 200 series acoustic guitars. 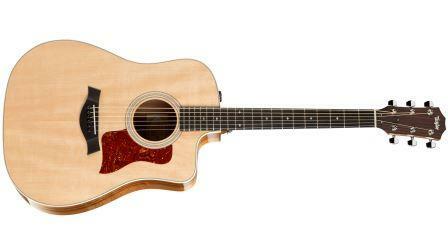 There are 14 guitars in the 200 series with prices ranging from $1,068 (USD MSRP) up to $1,738 (USD MSRP). THough the actual prices you pay are likely to be less. I will show a list of “actual” aka “street” prices at the end of the post. Before we get started looking at each guitar let’s see what the names stand for. The 2nd number signifies the type of the guitar. 1 for six string and 5 for 12 string. The 3rd number signifies the shape of the guitar. 0 is for dreadnought. 4 is for Grand Auditorium. We’ll look at the other letters as we look at the individual guitars. Starting with the dreadnoughts we’ll first look at the 210ce model. Going through the specs I wanted to see how this might differ from the 100 series equivalent – the 110ce. Apart from the back and sides and those 6 small, mostly cosmetic, things this guitar is the same as the 110ce. I was curious to see if there is any notable difference in sound or playability in these two guitars. So I played these two together at my local music store to see for myself. The 200 series versions definitely had that “rosewoody” tone to them. The highs were brighter and more pronounced and the lows were also more pronounced – the 110ce was more mid-rangey. I discuss the differences in more detail in the post at the link below. The next on the 200 series list is the 210 DLX. And this is why this is also the cheaper model. The DLX model does have some other minor differences which make it the “deluxe” model. Again these are only minor things. The major difference is the electronics and the cutaway – though it is good to get that hardshell case with the deluxe model. Literally the only difference between the 210e DLX and the 210 DLX is that the 210e DLX is fitted with the Expression 2 System electronics. The only difference between the 210ce DLX and the 210e DLX is that the 210ce DLX has a cutaway and the 210e DLX doesn’t. You could also look at this as the deluxe version of the 210ce. Whether you went with this one or the 210ce would depend on whether you thought it was worth the extra $270 for those little extras you get with the deluxe version – the major thing for me is that the deluxe comes with a proper hard-shell case. The main difference between the 210ce-K DLX and the 210ce DLX is that the 210ce-K DLX has layered Koa back and sides. The other small difference is that the binding is cream colored rather than white. I’m not sure how much difference in sound that the layered Koa would make – although there was a noticeable difference between the 110ce and 210ce because of the layered back and side wood used. Koa tends to start out life quite bright but becomes warmer as it ages. I’m not sure whether layered Koa would age the same as solid Koa though. This might also come down to which one you like the look of more. And if you do prefer the look of the Koa, then you’ll need to decide if you like it enough more to pay the extra for it. But the sound might also come into it. Now let’s take a look at the Grand Auditorium models. The only difference between the 214ce and the 210ce is the shape/size. But this is a fairly significant difference. Neither is better than the other but they will produce different tone, sustain, volume etc. so it comes down to the sound and feel that you like better. 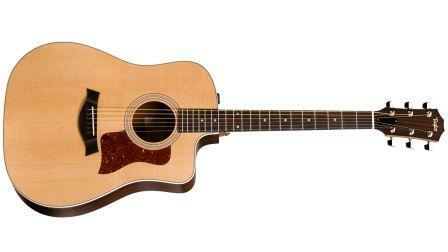 The 214ce is a grand auditorium shape as opposed to the 210ce’s Dreadnought shape. Taylor’s Grand Auditorium shape has a more defined waist between the lower and upper bouts compated with the dreadnought. 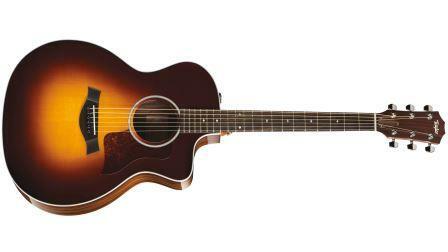 The sound is nice and balanced between being great for strumming and flat picking and also for fingerpicking. Where the Dreadnought excels at flat-picking and strumming and the Concert size is great for fingerstyle, the GA is the perfect balance of both. Wait, what’s the difference!? So there’s no actual difference in those specs – it’s the shape that makes the difference. As you can see in the image above the Grand Auditorium has a narrower waist than the dreadnought models. The differences between these models are the same as the differences between the Dreadnought models. Finally we come to the 254ce DLX. 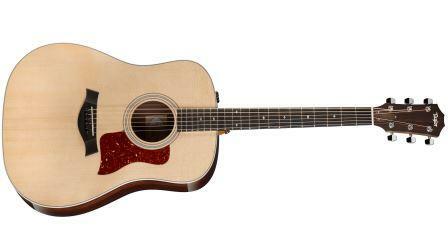 This is the only 12 string model in the 200 series. It is most similar to the 214ce DLX, having a Grand Auditorium Shape with cutaway plus electronics. 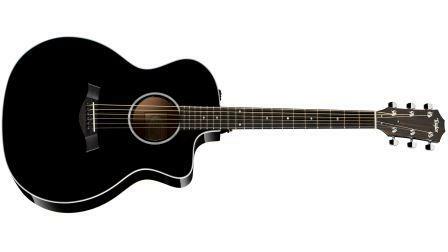 Practically the only difference between it and the 214ce DLX, is that it is a 12 string guitar. The other major difference is a wider neck to accommodate the extra strings. The 254ce DLX has a 1 7/8” (47.6mm) nut. The pricing above is the MSRP – which is usually above what the typical actual price is (when it comes to guitars). 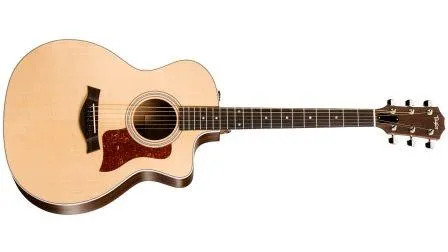 I hope this post has helped you to learn more about Taylor’s 200 series acoustic guitars and that you now know if any of the 200 series guitars are suitable for you. Do you know the difference between a 210e and a 214e ? Which one is a better guitar? Does the 210e mean it has DLX necessarily or is the DLX an upgraded version of the 210e? What is the diff between a 210e and a 210e DLX? Thanks for your help. Much appreciated your quickest response. 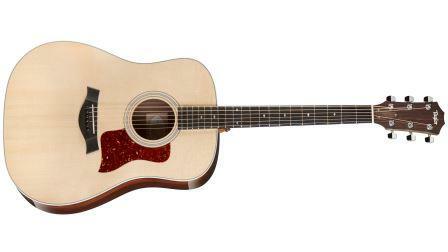 The 210e is a Dreadnought guitar – so it has Taylor’s Dreadnought shape/size whereas the 214e has Taylor’s Grand Auditorium shape/size. The Dreadnought will produce a boomier sound that has a higher volume ceiling but requires you to put in more effort to get a big sounds out of it. The Grand Auditorium is slightly smaller and has a narrower waist and this will be a little more responsive to a lighter touch (but as much so as something like a Grand Concert) and will have a lower volume ceiling (though not as low as something like a Grand Concert).